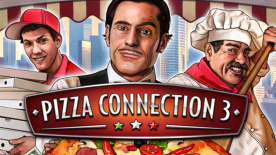 Mamma mia... Long awaited by fans around the world, the newest instalment of the cult series "Pizza Connection" returns to the PC with even more flavour and extra cheese. In addition to the series' tried and true basic ingredients, economic simulation Pizza Connection 3 offers a number of hot new toppings! Work your way through a challenging campaign to rise from a simple pizza baker in the streets of Rome to the owner of the world's most successful pizza chain! Use the famous Pizza Creator to design your own signature pizzas.